Cherries have pleased the palate for centuries. Their ruby-red colour and tangy taste placed cherries on the tables of Roman conquerors, Greek citizens and Chinese noblemen. Cherries were brought to America by ship with early settlers in the 1600s. Did you know that sweet cherry trees must experience sufficient winter chilling (between 800 and 1600 hours of temperatures between 2 and 12 degrees Celsius) in order to properly break dormancy and bloom over a relatively few days in the summer? Cherries are fat, sodium & cholesterol free and are a great source of dietary fiber. Cherries also deliver vitamin C which is beneficial for the development of healthy gums and teeth and helps to boost the immune system. Cherries act as an anti-inflammatory because they contain anthocyanin and bioflavonoids, which are compounds that produce a similar effect to that of aspirin or ibuprofen. These compounds can relieve or prevent head and body aches, and even ease the symptoms of arthritis and gout. When you bring your cherries home, refrigerate them immediately. Cherries can be kept fresh in the refrigerator for several days. Avoid placing cherries in the sun or warm areas as they soften quickly. 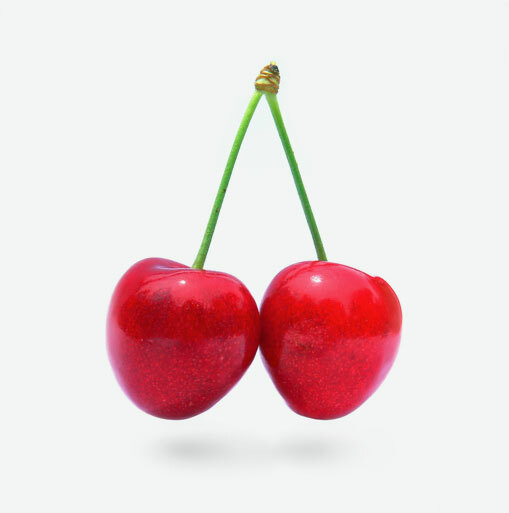 When selecting cherries, look for firm, plump, shiny cherries with green stems and avoid cherries that are soft or have brown spots. Don’t wash cherries until you are ready to enjoy them. Some standard favourites such as cherry pie and cherry cheesecake make decadent desserts. Cherries can be used in sauces, fruit salads, cooking with meats such as pork or duck, or they can simply be eaten fresh as a snack. Pitting cherries is easy. You can use a cherry pitter and pit them over a bowl to save the juices. If you don’t have a cherry pitter, you can use the tip of a vegetable peeler or the tip of a pointed knife.